Even after our stay in Tierra Del Fuego, we stay in Chile for a while and ride through the patagonian wind towards Puerto Natales. Although we have been warned about the wind many times, the stormy conditions do not give us so much trouble. You have to be a little bit more careful, take curves a bit slower and expect a higher consumption of fuel. But you certainly don’t need super powers, everyone can do it! 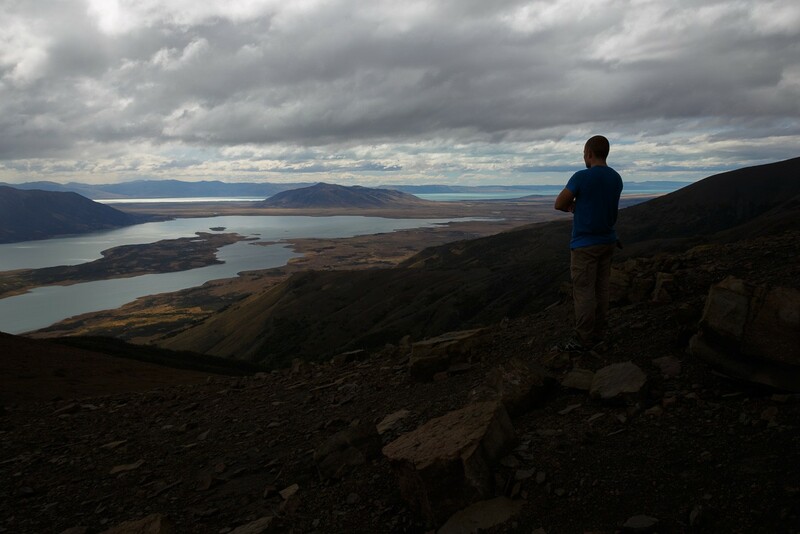 Finally, we reach Puerto Natales, a city flooded by backpackers. This is because Puerto Natales is the last city in front of the famous Torres Del Paine National Park, which attracts tourists from all over the world. With its several-day W-track, it is considered to be hiking heaven. We do not want to deny that this also caused excitement in our hearts. They say it’s one of those places you have to visit as a hiker. 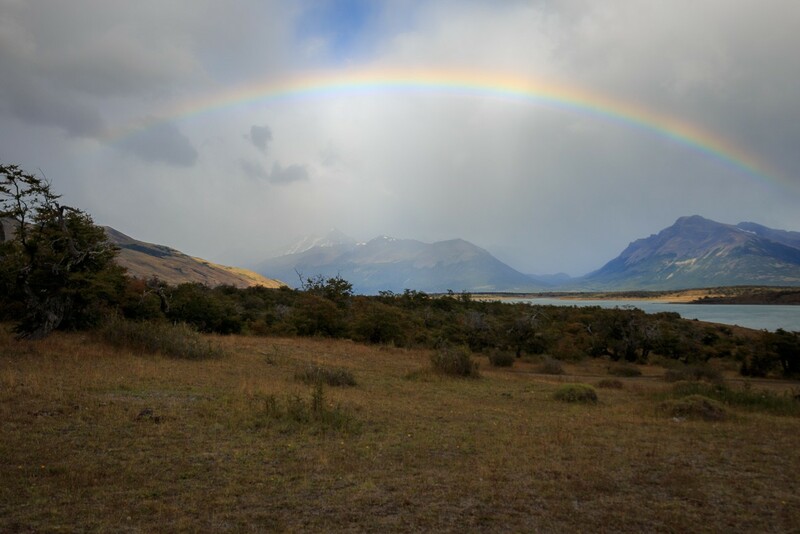 And since there are many hikers in the world and even more people who want to make good money, the eminence of the Torres Del Paine Parks led to some developments. It starts with paying a heavy entrance fee for the park. For every visit of a toilet you pay around one euro, food prices are exorbitant. A bed in a dormitory costs a proud $50, if you want a blanket to sleep, then another $30 on top. If that’s too expensive, you can go to the campsites, but only if you have already reserved. If you don’t own a tent, sleeping bag, etc. you can rent it for a lot of money, too. Wildcamping is forbidden. By the way, if you’re willing to pay all this, you still can’t hike the W-track. Because you have to book all the campsites that are along the way. Without this proof you cannot enter the path! Well, that’s Torres del Paine. It is not just that it is absolutely impossible for us to have a schedule a month in advance… we are particularly sick of this commercialisation. Do not misunderstand us: we would like to pay some money for the preservation of nature, appropriate facilities etc.. but that has nothing to do with it. We talked to a lot to people, who were there just recently. Many of them were disappointed, felt constrained in their hiking freedom by reservations, some also talked about rip-off. This is why we dispense the hiking on crowded, well-trodden paths and ride past this certainly beautiful park. We go on and arrive in the National Park of the Glaciers. Close to the great Perito Moreno Glacier, we stay at a beautiful campsite, right in front of the great Lago Roca, surrounded by impressive snow-covered mountains. From here, we can even see the Cerro Torres in the Torres Del Paine National Park. Voilà: we stay at a free camping site in the free national park and go to a hiking trail the next day, which also doen’t cost anything. Here, we are completely undisturbed, it is an exceptionally nice place. That’s how it goes. The hiking trail leads and over 1095 metres of altitude on top of the Cerro Cristal. And this trail is most certainly not for untrained legs. Instead of a gentle rise over serpentines – as usual for hiking trails – it goes straight up in steep steps. Whoever made this path was extremely ambitious to reach the summit and was very confident in terms of the condition of future hikers. Such a progress is hard stuff. Especially when you haven’t hiked for some time. 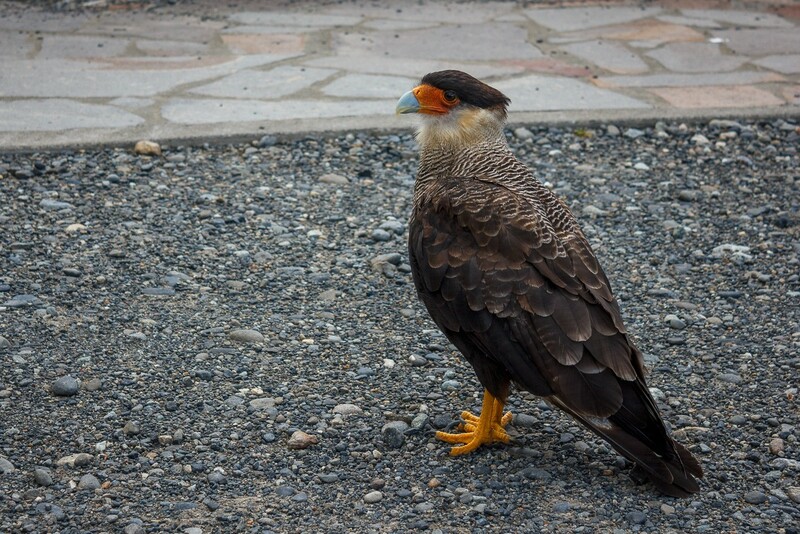 In addition, the weather in the mountains can change abruptly. We have to deal with heavy rain that takes turns with sunshine every few minutes. It is a real fight for me. I need some breaks and encouraging words from Moe to keep going after several moments of resignation. However, all the effort is forgotten when we can enjoy the great view of the lakes and mountains. From here, we also see the giant glacier that we would like to visit in the near future. When you are hiking, you always get richly rewarded, that is why i love it that much. The next morning starts with a hard hit. When I crawl out of the tent, I can see that something’s wrong in Moe’s face. “The camera is broken” he answers me when I ask what’s going on. Yesterday, Moe assured me that the camera was waterproof, but when photographing in the heavy rain, it seems that something went through an obviously non-waterproof objective. We’re trying everything possible to fix the problem, but it does not help. We can forget the camera for now. Even if we have to be satisfied with a little less for the upcoming times, we are glad that we have a second, smaller camera with us at this moment. 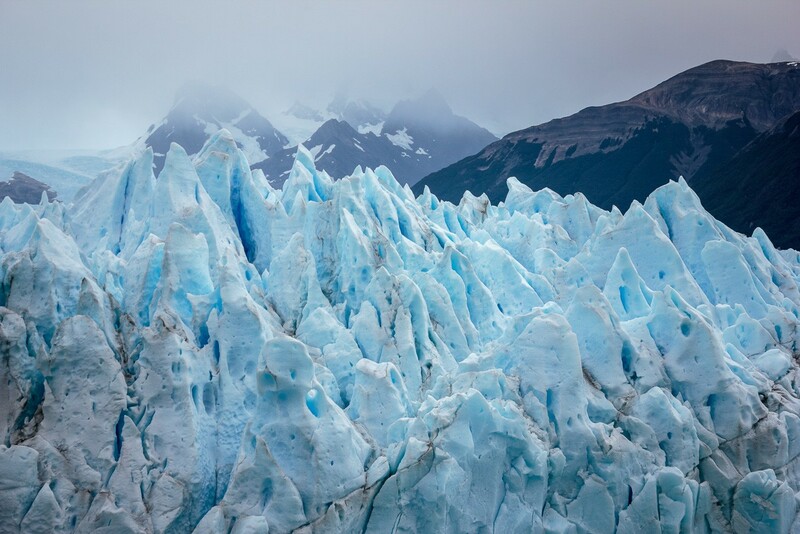 When we stand in front of the Perito Moreno Glacier, we don’t want to think about how annoying it would be without a camera right now. It’s a unique experience to stand so close to this colossus. Big ice pieces are breaking off the glacier with a huge noise before they plunge into the water. Like many times before, we fell really, really small in the face of this power of nature. The appearance of this titan is hard to catch in a picture. We are riding further north, going back to the National Park of the Glaciers. The ride is mighty cold, foggy and rainy. It’s a pity that the imposing mountains surrounding El Chalten are shrouded in thick fog when we enter our destination. We’re completely frozen when we arrive. But the next day it looks quite different. In bright sunshine, we start a tour that I’ve been very excited about for a long time: we hike to Fitz Roy. Although it is already low season, we are not the only people who have set this goal today. You can search for lonely hiking trails in vain here. But on this trek, it’s absolutely not surprising that word has spread about how beautiful it is. On the well-developed 10 km long path to the Laguna de los Tres, we just need to take a few steps to get to spectacular views of the valley. Unlike our previous hike to Cerro Cristal, you have a very gentle climb along a small nature trail that is very well maintained. It’s incredibly beautiful and breathtaking. After half an hour, we finally reach the point from where you can see one of the most beautiful and most impressive peaks in the world: there he is, the Fitz Roy. We are absolutely in love with this view! Is there a more beautiful place to have a snack? On the next kilometers, the epic view accompanies our way. We are constantly stop for a few seconds to let us be captivated by the divine mountains. I can’t believe I’m finally here! The versatile path has a lot to offer: we stalk through magical forests, cross wide valleys, jump over rugged cliffs and rest on the raging river. Hiking can’t be more beautiful (well, maybe it would be even more beautiful if we had the trek for ourselves, but I really don’t want to complain). The last part of the way up to Laguna de los Tres is a little more demanding. The fairly rapid rise over large stone slabs is the reason why this route is classified as “difficult” on the hiking scale. Pah, that’s nothing compared to the hike to Cerro Cristal! God knows why this trails level of difficulty is regarded as “normal” by the way. Since it is now a little more challenging which makes many of the hikers slowing down, it is particularly congested here. Now here are really too many people. All the time, you have to wait on the way up because you have to let others go down or you are stuck behind slow hikers. 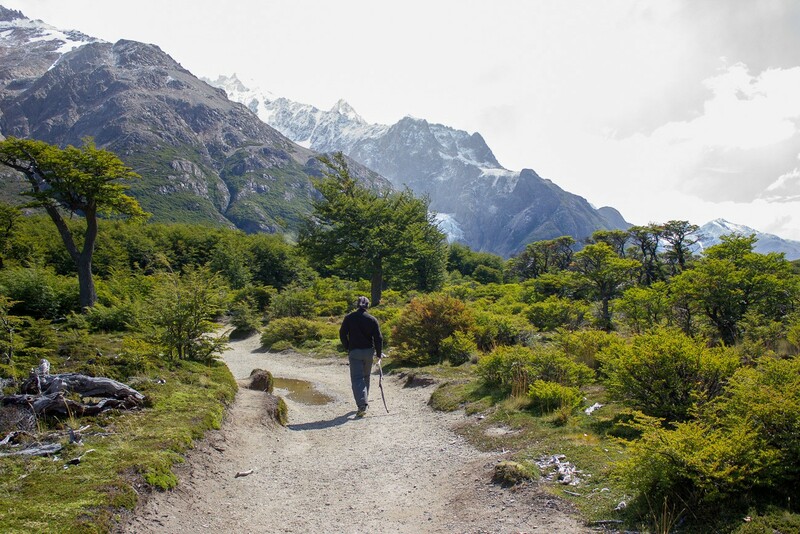 Because we still feel quite fit at the top, we take an extratour and hike through a great piece of forest across to the Glacier Piedras Blancas. When we arrive, the glacier is shrouded in fog, anyway, the path was great. After the 24 km long day trip we happily return to our tent. We agree that we want to explore a bit more of this area. 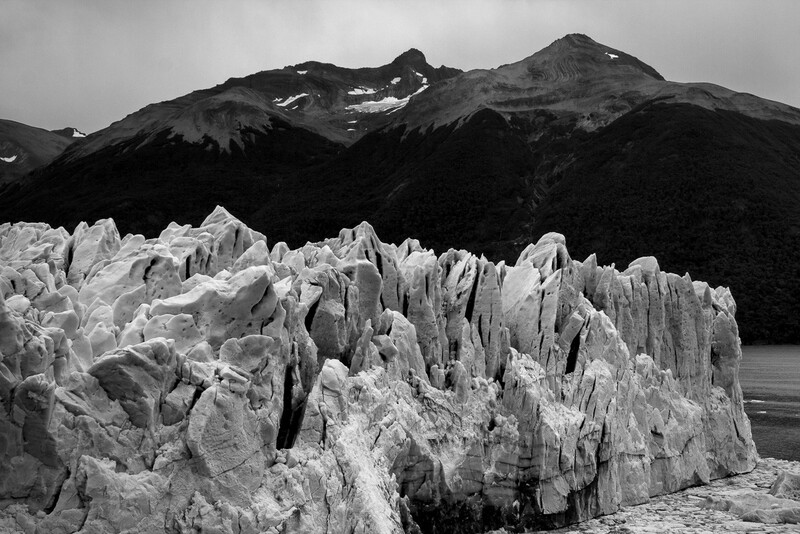 After a day of bad weather, we want to go to Cerro Torre. The Schnaps at the peak is obligatory!